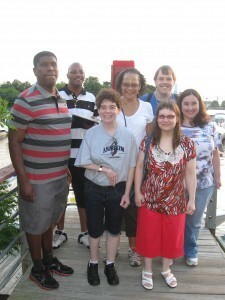 Whether it’s learning new life skills or enjoying social activities, there is always an opportunity to have fun and make new friends through The Arc’s Recreation Programs for adults with disabilities! 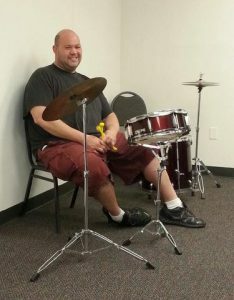 The Recreation Program offers a wide range of activities for adults with disabilities geared toward providing entertainment and socialization opportunities throughout Burlington County. 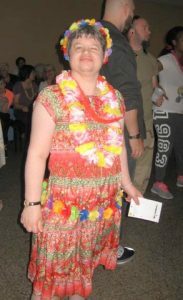 Activities and events for developmentally disabled adults include monthly dances, Nights Out for Dinner, day trips, picnics, Broadway shows, holiday parties and many other monthly activities. For additional information about the Recreation Program, contact Donna Healey@ (856) 985-7345, or email her at healeydm@aol.com. 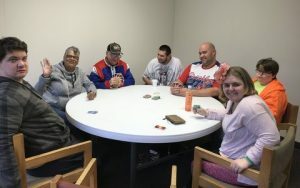 CLUB CONNECT, is an innovative program that provides community-based and on-site recreational activities each Thursday evening from 6:30 – 8:30 in Lumberton, NJ. Participants can select from a variety of activities that include physical fitness, board games, improving computer skills, arts and crafts, listening to or making music or just socializing with friends.Get more information here. 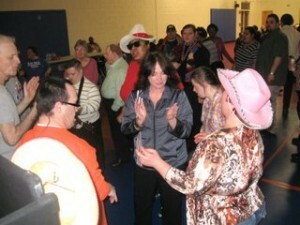 Our monthly dances take place on Friday evenings at various locations throughout Burlington County and are open to men and women with intellectual or developmental disabilities and their families. Dances run from 7:00 – 9:30 p.m., and there is a $4.00 admission fee that also includes refreshments or other goodies depending on the dance sponsors.There is no charge for parents or staff accompanying dancers. Those attending who require supervision must be accompanied and supervised by a responsible adult, and all others must have an UP-TO-DATE emergency medical form on file with us (available at the entrance of the dances) to allow us to notify an emergency contact should the need arise. Please return the updated completed form to staff at the dance or mail it to The Arc of Burlington County, Recreation Department, 115 E. Broad Street, Burlington, NJ 08016. 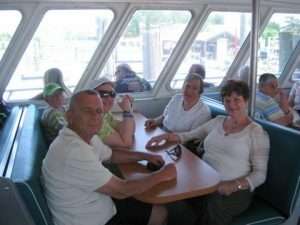 MURDER MYSTERY DINNER THEATER – This bus trip to Fisher’s Tudor House in Bensalem, PA includes the murder mystery Comedy Show, “Murder at Mardi Gras,” in a private banquet room, dinner, deluxe motor coach transportation and all taxes and gratuities. The event is open to adults with developmental disabilities and is sponsored by The Arc of Burlington County. TIME? 2:15 – 7:35 p.m. NIGHTS OUT FOR DINNER – These events are open to adults with disabilities who have a high level of independence. Join us for a night out to dine and socialize without parents or staff. Must be pre-registered by calling Donna to leave a message at 856-985-7345, then pay your registration fee of $7.00 by check to The Arc of Burlington County, 115 E. Broad Street, Burlington, NJ 08016. Pay for dinner the night of the event either by check or exact change. Meet at each restaurant at 5:50 p.m. and prepare to leave by 7:30 – 8:00 p.m.
April 18, 2019 – The Kettle and Grille, 230 Maple Avenue, Marlton, NJ. (In Crispin Square Shopping Center.) Phone 856-574-4910. Bring $23 for dinner. Optional dessert is $5.00 extra. May 9, 2019 – Maritsa’s Main Street Cafe, 106 E. Main Street, Maple Shade, NJ. Phone 856-779-7722. Bring $23 for dinner & dessert. Request pickup time of 7:30. June 6, 2019 – Francesco’s, 351 High Street, Burligton, NJ. Phone 609-747-1400. Bring $23 for dinner & dessert. Request pickup time of 7:30. July 11, 2019 – Ristorante al Fresco, 1155 Route 73, Mt. Laurel, NJ. phone 856-727-5007. Bring $23 for dinner & dessert. Request pickup time of 7 p.m.
August 8, 2019 – Ragazzi Restaurant, Marlton Greene Shopping Center, 44 Route 70 W, Marlton, NJ. Phone 856-810-8810. Bring $26 for dinner and $3-$5 for optional dessert. Request pickup time of 7:30 p.m.